LED solar lighting means low-cost lighting building using LEDs. LED stand for Light Emitting Diode. LEDs and Solar panels both utilize semiconductors. The difference between the two lies in how they use the semiconductors. Solar Panels utilize semiconductors to harness the power of the sun, where LEDs use semiconductors to emit either infrared, visible or near visible rays of light. Because of their use of use of semiconductors, LEDs are a great low-cost and energy efficient lighting option. This also allows for a wide variety of sizes, shapes and colors of LEDs to be available. You have probably come across LED lighting without even realizing it. For example, they can be found in remote controls, computers and even traffic control lights. Because LEDs produce more light per watt than incandescent lights do, LEDs are well suited to solar energy applications as they are extremely energy efficient and cost-effective. Another reason that LEDs work so well for solar power applications is that they stay cool to the touch, where other types of lighting options heat up. 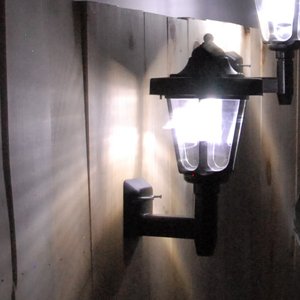 This makes them safer than other types of lighting for exterior and interior lighting applications. As technology has increased and evolved, so has the performance of LEDs – today, LEDs are 3 – 4 times brighter than the LEDs of the past. LEDs are extremely efficient all around, and use far less power than incandescent, and even fluorescent, lights. Another great advantage of LEDs is that they will not blow out, and last far longer, than traditional incandescent and fluorescent lights. This means less expenditure in replacement and maintenance costs over the lifetime of your LED lights. LED solar powered lighting is really quite common. In fact you have most likely come across LED lighting without realizing it. LEDs are utilized in, for example, computers, remote controls, and even in traffic lights. LEDs emit more light per watt that incandescent lights do, which makes them ideal for solar energy applications. Additionally, high-quality, great-looking LED lights and light fixtures are one of the most popular trends in new, energy-efficient, green home building. In fact, most LEED certified homes and buildings utilize LED and solar lighting because of their tremendous economic and environmental benefits. Interested in learning more? Check out our LED Solar Lighting here.